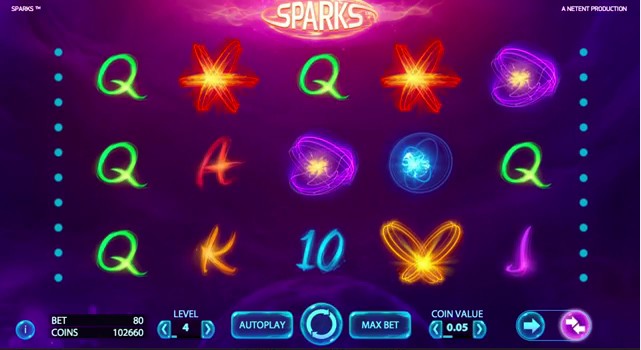 There’s a certain style of online slot we’ve come to expect from Net Entertainment and Sparks is a fine example; it combines addictive, attractive gameplay with bonus features that take place within the base game rather than being a separate feature. Sparks is an electronically-themed game with a soothing soundtrack and some creative ideas so read the full review below for more information. 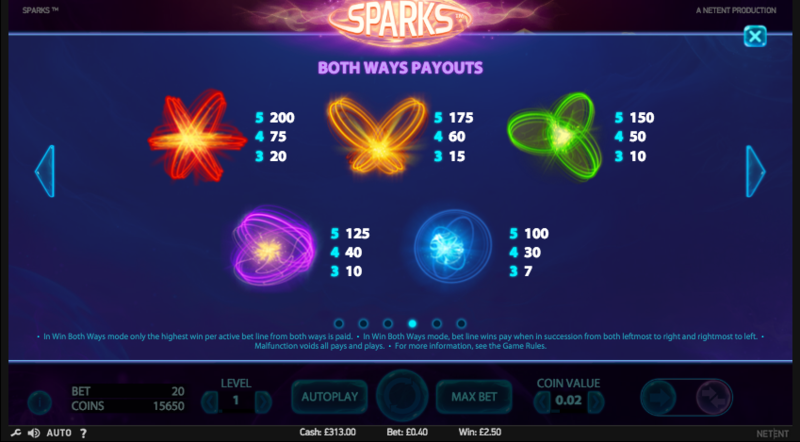 Sparks is a five reel slot with three rows, twenty paylines and an interesting payline structure; why is it interesting you ask? Because players can choose to play the standard ‘left to right’ paylines or they can opt to play with ‘right to left’ paylines as well. This is an interesting feature we’ve not seen before and while playing the ‘both ways’ option may seem more profitable, a quick check of the paytable will show you that all prizes are halved so the the outcome remains the same either way. The five high value symbols are a range of coloured sparky trails – red, orange, green, purple and blue; 10, J, Q, K and A are the lower values. The wild symbol is a ‘W’ in a glowing blue sphere and it substitutes for all others except the Expanding Cloning Wild symbol; that’s represented by a big, gold ‘W’ and it’s described in more detail below. Possible expand up, down or both ways to fill the entire reel; if you’re unlucky it may do none of these. The symbol to the left of the wild will now be replicated to it’s right, meaning that you have a guaranteed win of at least three matching symbols. If the wild expands then those symbols to the left will also be cloned. If the wilds appear in the same positions on reels two and four in the same spin the same symbol will be cloned to reel three and then five for a five of a kind win. If you believe in fine margins then you may be interested to know that the RTP when playing one way is 96.56% and the RTP for both ways is 96.54%. Sparks is another eminently playable online slot from Net Entertainment and we’ve already spent a fair bit of time on it. It looks good, it sounds good and it comes with an RTP of 96.54% – 96.56%.